Large Hadron Collider researchers have shown off what may be the facility's first "new physics" outside our current understanding of the Universe. Particles called D-mesons seem to decay slightly differently from their antiparticles, LHCb physicist Matthew Charles told the HCP 2011 meeting on Monday. The result may help explain why we see so much more matter than antimatter. The team stresses that further analysis will be needed to shore up the result. At the moment, they are claiming a statistical certainty of "3.5 sigma" - suggesting that there is less than a 0.05% chance that the result they see is down to chance. The team has nearly double the amount of data that they have analysed so far, so time will tell whether the result reaches the "five-sigma" level that qualifies it for a formal discovery. The LHCb detector was designed to examine particles containing so-called beauty quarks, watching them decay through time after high-energy collisions of other fundamental particles. The LHCb Collaboration was looking at decays of particles called D-mesons, which contain what are known as charmed-quarks, which can in turn decay into kaons and pions. LHCb, one of the six separate experiments at the Large Hadron Collider, is particularly suited for examining what is called "charge-parity violation" - slight differences in behaviour if a given particle is swapped for its antimatter counterpart (changing its charge) and turned around one of its axes (changing its parity). Our best understanding of physics so far, called the Standard Model, suggests that the complicated cascades of decay of D-mesons into other particles should be very nearly the same - within less than 0.1% - as a similar chain of antimatter decays. Other experiments, notably at the Fermi National Accelerator facility in the US, have not definitively found a notable difference between the two kinds of decay of D-mesons. But the LHCb team is reporting a difference of about 0.8% - a significant difference that, if true, could herald the first "new physics" to be found at the LHC. "Our result is more significant because our precision is improved - somewhat more precise than all of the previous results put together," Dr Charles told BBC News. Spotting such a difference in the behaviour of matter and antimatter particles may also finally help explain why our Universe is overwhelmingly made of matter. "Certainly this kind of effect, a new source of CP violation, could be a manifestation of the physics which drives the matter - antimatter asymmetry," Dr Charles explained. However, he stressed there are "many steps in the chain" between confirming the collaboration's experimental result, and resolving the theory to accommodate it. "This result is a hint of something interesting and if it bears out, it will mean that, at a minimum, our current theoretical understanding needs improving," Dr Charles said. 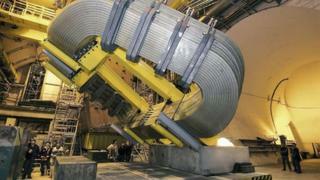 "It's exactly the sort of thing for which the LHC was originally built."